CH-47F Crew Chief over Afghanistan (photo USAF Tech Sgt Gregory Brook, March 15, 2018). SOF News Update 20180323 – Russia’s SOF training in Gulf of Finland, Dunford enthusiastic about 1st SFAB, 1966 door gunner training video, OSS receives Congressional Gold Medal, LE CT training facility opens in Jordan, Poland’s more modern military, joining the SFABs, Erik Prince in the news again, AFSOC Cdr’s addresses Airmen, CT in Afghanistan, SOCOM’s WMD mission, DARPA’s ‘COMPASS’ program and the ‘Gray Zone’, and more. Russia’s SOF Training in Gulf of Finland. SOF units based in Russia’s Western Military District have been conducting exercises with special operations forces on islands in the Gulf of Finland. (EER.ee, Mar 21, 2018). A Day of Death in Iraq. Derek Gannon writes about one day in Iraq in 2008 while assigned to the 5th SFGA CIF company. Read “Mortus Discrimiatus: The day I almost died in Iraq”, Fusion Cell, March 21, 2018. DARPA’s ‘COMPASS’ Program and the ‘Gray Zone’. The Gray Zone is conflict that exists in a nebulous area between peace and traditional warfare tactics. The Defense Advanced Research Projects Agency is rolling out a new program called COMPASS or . . . Collection and Monitoring via Planning for Active Situational Scenarios. (American Security Today, Mar 20, 2018). Dunford Enthusiastic About 1st SFAB. The Chairman of the Joint Chiefs of Staff – General Joe Dunford – spent a little time visiting Afghanistan. While there he met with some of the ‘combat advisors’ of the 1st Security Force Assistance Brigade (SFAB). He seemed impressed with an ongoing combined operation involving the 201st ANA Corps, police units, and the National Directorate of Security. (Defense Media Activity, Mar 21, 2018). LE CT Training Facility in Jordan. Funded by the United States, a law enforcement counterterrorism training facility has now opened in Jordan. (AP, Mar 22, 2018). SOCOM’s WMD Mission. The United States Special Operations Command is the lead U.S. agency for countering weapons of mass destruction. With the advances in technology the use of chemical, biological, and radiologic weapons by terrorist groups becomes more likely. The new National Defense Strategy is making it easier for SOCOM to get the intelligence capabilities and tactical gear it needs to tackle the WMD problem set. Read an article on this topic by Patrick Tucker in “For Special Operations Forces, Fighting WMD Means Getting Deeper Into Enemies Leadership and Decision-Making”, Defense One, March 22, 2018. CT in Afghanistan. Nicholas Glavin writes that the U.S. strategy of R4+S – regionalize, realign, reinforce, and reconciliation, plus sustain – provides the best way ahead for SECDEF Mattis vision of winning. AFSOC Cdr Addresses Airmen. On March 13th the Air Force Special Operations Command boss – Lt. Gen. Bard Webb addressed his staff to explain his thoughts on the new National Defense Strategy guidance. (AFSOC DVIDS, Mar 19, 2018). Read “Sustaining U.S. Counterterrorism Pressure in Afghanistan”, The National Interest, March 20, 2018. Analyzing ‘Marauders’. Chris Flaherty, a Senior Research Associate of the Terrorism Research Center, provides us a modern-day definition of ‘marauder’ – arguing that the marauder is an example of asymmetric operations. Read “The Marauder as an asymmetric operational concept”, Small Wars Journal, March 22, 2018. Erik Prince in the News Again. One of America’s more famous former SEALs – and the founder of Blackwater – finds himself in the news. Read “American Mercenary Was in Talks with Azerbaijan over Weaponized Crop Duster”, Eurasianet, March 21, 2018. Joining the SFABs. BG Mennes, director of force management (G-3/5/7), provides info on the assessment, selection, and training of soldiers filling the ranks of the Army’s Security Force Assistance Brigades (SFABs). See “Soldiers in SFABs high-end achievers, says BG Mennes”, Army News Service, March 19, 2018. Poland’s More Modern Military. Russia’s increasing aggressiveness over the past decade has the Poles worried. The terrain of Poland – mostly flat ground easily traversed by tanks and motorized infantry – puts the country at a military disadvantage. Poland has been hard at work in increasing its military capability. Read more in “Preparing for the Worst: Poland’s Military Modernization”, Geopoliticus: The FPRI Blog, March 22, 2018. 1966 Door Gunner Training Video. This 3-min long video provides some insight into the training of U.S. Army helicopter door gunners. (Task & Purpose, Mar 12, 2018). OSS Receives Congressional Gold Medal. The Office of Strategic Services was recognized by the U.S. Congress on Wednesday (Mar 21st) for its contribution to the war effort during World War II. (The Washington Times, Mar 21, 2018). See also a press release from Speaker Paul Ryan’s press office entitled “Congress Presents Gold Medal to the Office of Strategic Services”, March 21, 2108. SOF News provides news, analysis, commentary, and information about special operations forces (SOF) from around the world. 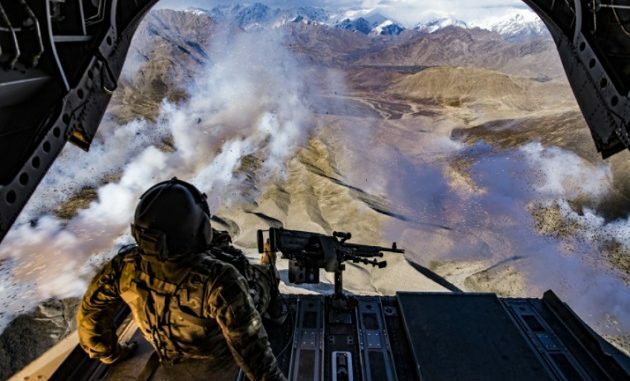 The intent of SOF News is to provide informative articles, news, analysis, and commentary about Special Operations Forces (SOF) from around the world; including current and historical accounts.